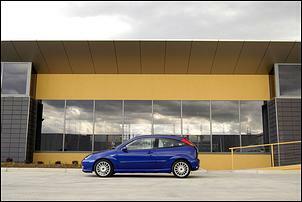 A hot hatch that could do with a few more Nm and kW - or less weight. 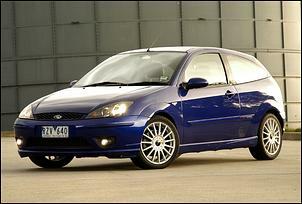 Don't get us wrong - the ST170 is in no way a bad car. This is a vehicle that's competent in all areas and which comes together as a well-rounded package - but it promises enthusiast performance and ultimately fails to deliver. First let's look under the bonnet. The ST170's 2.0-litre Duratec four is based on the established Zetec motor, uses a cast iron block, cast aluminium pistons (for a 10.2:1 compression ratio) and forged steel conrods. 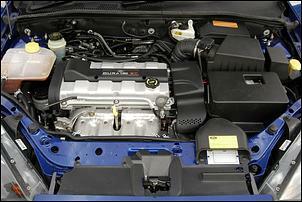 Its alloy DOHC cylinder head employs larger intake ports and intake valves, along with firmer valve springs. The ST170's camshafts also provide more lift and the inlet cam is continuously variable over a 60-degree range. A dual-length intake system (which changes runner length at 6000 rpm) improves the spread of torque while equal-length headers and a 65mm exhaust allow maximum breathing. These traditional tuning techniques have achieved an impressive 127kW output at 7000 rpm along with 196Nm from 5500 rpm (with up to 85 percent of peak torque available from 2200 rpm). With 63.5kW per litre, the ST170 offers the best specific power output of any non variable valve lift NA 2.0-litre on the market. Looking good so far, eh? 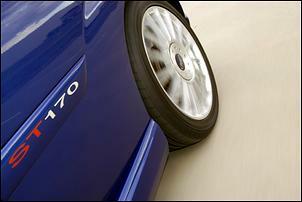 The ST170 also comes with a 6-speed Getrag gearbox that gives v-e-r-y short gearing. The combination of a flat torque curve and short, close-ratio gearing gives the ST170 brilliant flexibility - you can accelerate from the lights shifting from 1st to 3rd to 5th without any protest from the engine and without losing any ground to other cars. There's no question it's a very practical, useable engine. Okay, but is this thing fast? More grunt and/or less weight please, Mr Ford. Fuel consumption during our test averaged around 10.5-litres per 100km - however, this was achieved in pretty demanding conditions and we suggest Ford's AS2877 figure of 9.5-litres per 100km (city cycle) would be fairly typical. Fuel tank capacity is 55-litres - and make sure that only 95+RON fuel goes down the filler. The ST170 employs the same suspension architecture as other Focus models - a MacPherson strut/lower A-arm front-end combined with a Control Blade multi-link IRS. Changes to the ST170 include 10 percent stiffer front and rear springs, larger diameter dampers and firmer bushing for the rear swaybar. Interestingly, the swaybars remain unchanged from lesser model Focuses. With the electronic VSD system left active (why would you turn it off?) the ST170 always feels stable when put through a corner. The combination of a relatively narrow body, wide track, low profile tyres and direct steering also contribute to a high degree of accuracy and controllability. Provoke it into oversteer (by lifting off the throttle sharply through a corner) and the tail eases out oh-so progressively and controllably. The Continental ContiSport Contact 215/45 17 tyres are nicely suited to the package and - despite their 45-series profile - the ST170 rides extremely well. It copes very well with sharp irregularities (such as road joins) and is always comfortable. The rack-and-pinion steering arrangement provides great accuracy but could benefit from slightly more feel. A fairly typical 10.9-metre turning circle is quoted, but we were often caught out needing to make a 3-point turn where we thought it'd manage a U-turn - the relatively low front spoiler means you can't swing the nose over gutters. The brakes represent a truly massive upgrade over the cooking Focus models. At the front you'll find stonking 300mm ventilated discs (up from 258mm) and the rear gets 280mm solid discs (up from 253mm). The calipers have also been revised and ABS and EBD control come as standard. When you consider the size of its brakes it makes sense that we didn't encounter any brake fade during our road test! High marks here. From a cosmetic standpoint Ford has done very well - the ST170 has an aerodynamic wedge profile coupled with the sharp highlights that are currently trendy. The front, side and rear skirts along with the rear spoiler are nicely integrated and the 17-inch multi-spoke wheels make a sporty statement. The ST170 also gets a chrome exhaust tip, a bolder radiator and bumper grille treatment, restyled headlights and projector-style fog lights. 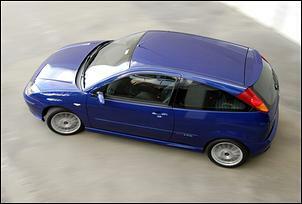 You can get the ST170 painted in whatever colour you like - so long as it's Imperial Blue. It all comes together as an attractive vehicle - our only criticism is the rear quarter looks slabby from some angles. 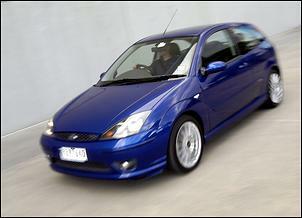 Note that the ST170's body kit was designed in Australia and is unique to the local market. A 0.337 aero Cd is claimed. 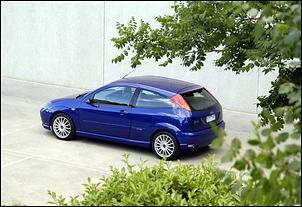 The ST170 is sold as a 3-door hatch only but it does offer a good amount of useable space. Front seat occupants have adequate space and the rear seat - which is designed for three, but more suited for two - has good access. The rear backrest is 60/40 split allowing the already decent luggage area to be expanded and you'll find a space saver spare wheel hidden beneath the floor. 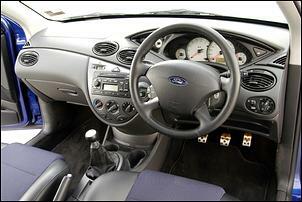 The hot Focus' driving position is comfortable except for the closeness of the pedals. A sporty interior feel comes from the ST170's drilled pedals, leather wheel, metallic highlights and silver-faced instrument cluster, electro-luminescent gauges. The tacho flaunts a 7200 rpm redline and you also score an oil pressure and oil temperature gauge in addition to the usuals - it's just as shame the oil press and temp gauges have no scales... Other features include remote central locking/security, air-conditioning, front and side airbags, seatbelt pre-tensioners, electric seat height adjustment, power windows and mirrors. There's also a 6-disc CD sound system that sounds pretty good. Note that there are few features missing from the ST170's spec list - cruise control, a trip computer and climate control are not available, even as options. If you're in the market for a hot hatch and you're not too bothered about accelerative performance, the Focus ST170 is worth a look. But if sheer speed is needed to put a smile on your face, we suggest looking at the turbocharged and supercharged alternatives. 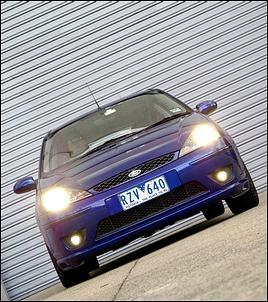 The Focus ST170 was provided for this test by Ford Australia.